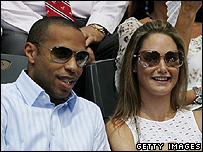 Former Arsenal footballer Thierry Henry's estranged English wife, Claire Merry, has been granted a divorce. The decree nisi order was granted on the grounds of Henry's behaviour, according to court papers. Details of the French international's behaviour referred to in Ms Merry's divorce petition were not released. The pair, who have a two-year-old daughter, Tea, did not attend the hearing at the Principal Registry of the High Court's Family Division. The divorce was one of 34 decrees nisi approved by District Judge Malik in just over a minute. Henry and Ms Merry shared a six-bedroom home in Hampstead, north London, which Henry bought five years ago for £5.95m. They met when they starred together in TV adverts for Renault Clio cars. Henry announced he was leaving Ms Merry in June, just before his transfer to Spanish club Barcelona.